Has the rain already started reeking havoc with your pavements? Is your driveway being destroyed by water? Have you been witnessing frost heaves and cracks in your parking lot? If yes, do not worry. With asphalt patches, you will be able to give a new life to your pavements, driveways and parking lots. Asphalt driveways and pavements are not resistant to corrosion and decay. Even though asphalt is a long-lasting substance, it is prone to destruction. There are many external factors that play a pivotal role in spoiling asphalt constructions. For instance, it is a known fact that sunlight and heat causes asphalt to decay. Sun’s ultra-violet rays, especially, are quite harmful to asphalt. Similarly, water destroys asphalt surfaces by initiating the oxidation process which corrodes asphalt from within inside. In such a case, it is quite impossible that your asphalt driveways and pavements will stay the same over years. You will eventually see potholes and cracks developing on your asphalt surfaces. When this happens, asphalt patches will be of great help. If you witness any cracks, potholes, ruts or frost heaves, take immediate action. It is far more easier and cost effective to repair pavements and driveways than to have them constructed all over again. With asphalt patches, you will be able to make your pavements and driveways look as good as new. Asphalt patching is also one of the most easiest and reliable ways to take care of cracks and potholes that develop on the surface of asphalt constructions. The best part about asphalt patches is that they are quite easy to put — you won’t need an expert hand. You will, as a matter of fact, be able to do it all by yourself with the RENOVA. This way, you will also be able to save a lot of money by not having to hire workers to do this tricky job for you. An asphalt patch is essentially a cold mix created using asphalt concrete. This material is created by emulsifying asphalt in soap water. The emulsified mixture is then mixed with an aggregate to create a solid substance that can be effectively used to repair cracks and potholes. The best part about an asphalt patch is that it fights back in all kinds of weather. Neither wind nor rain will be able to destroy it. It will stand the test of time. It is quite easy to create asphalt patches. 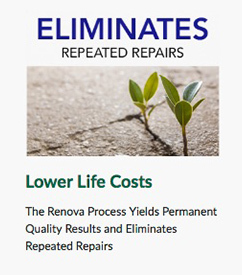 All you need to do is fill the visible crack or pothole with asphalt concrete mixed using an asphalt recycler like the RENOVA. 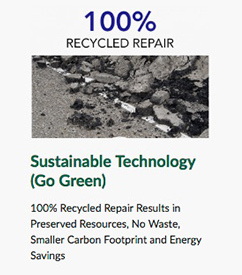 If you don’t have asphalt recycling equipment, simply roll a tire over this mixture. The external pressure exerted will cause the mixture to settle down and completely occupy the void space created by a crack or pothole. If you find that your asphalt patch material has frozen, simply ram some of the material on the floor and roll it over a couple of times. This will cause the material to regain its original powdery state. You will then be able to use it quite easily. Asphalt patches are being used by people all over the world because they are a permanent solution to a problem that we all face. 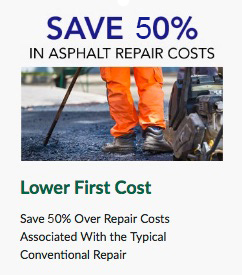 If you have been fighting with potholes and cracks, bring asphalt patches to your rescue.